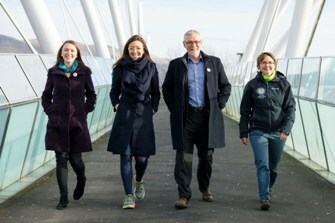 A Forth Valley charity has become the first employer in Scotland to earn the Walk at Work Award. The charity’s 22 employees rack up an impressive amount of physically activity. One survey showed staff were averaging 87,000 steps each - the equivalent of walking from Stirling to Falkirk and back twice. 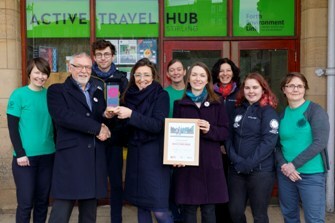 Forth Environment Link are looking for two dynamic members of staff to become part of its Active Travel team. The first will deliver dedicated support to the pupils of Lornshill Academy, in Alloa, to improve awareness of active travel choices and foster an active travel culture within the school. 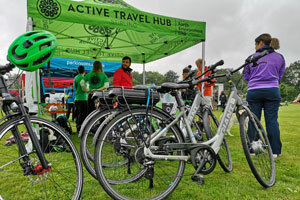 The second vacancy will deliver dedicated support and management of the Forth Valley Regional E-Bike Share scheme, including improving access to the scheme, overseeing promotional activity and managing its operations across Forth Valley and more widely. Forth Environment Link is starting 2019 in a wheely good way by giving out 250 discount vouchers for Stirling’s public bike share scheme, nextbike.